The basic phases of building a pool, from first thought to the big opening splash. Whether you’ve just moved to the Valley of the Sun and decided you can’t make it through summer without a pool or you’ve lived here for years and envied the neighbors’ pool parties, there’s no time like the present to build your own oasis in the desert. While it’s best to leave the actual building to the professionals, here’s a look at what you can expect the process to look like. I want a pool. Now what? Builders have a similar basic schedule: client approves design/pool model; builder sets up a plan and schedule; builder secures permits and subcontractors; lots of digging, plumbing, electrical work gets done on your property; the pool gets a pretty finish; final inspections happen; the crew cleans up; and the builder’s representative makes sure you know how to care for your new splashy investment. Your pool contractor is going to be spending a lot of time on your property. 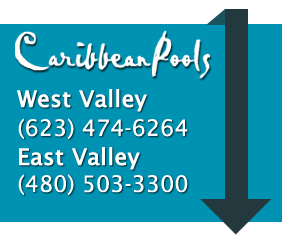 A quality builder, like Caribbean Pools, knows that your satisfaction depends on a strong foundation of trust, communication, and company integrity. A 3D design model and build-out schedule will be personally detailed for you. Weather may play a part in the actual construction, plumbing, and electrical phases of the schedule, but you’ll be kept aware of any delays or time savings throughout the project. When the completed project is clean and ready, your representative will be there to walk you through the care of your new outdoor space. This project is about your wants, your dreams, and your personal space. Build with the right company and you’ll build with confidence!